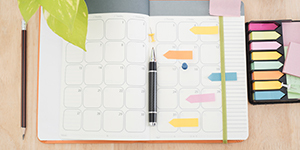 A new year offers a fresh chance to sharpen your organizing skills! Break new ground with these tools and tips that will save you time and keep your groups organized — while connecting more people to causes that make a difference. Sit down and plan family activities through the spring (at least) to maximize your time in the new year. If there are any events you’re in charge of, make a reminder of when you need to create your online sign up by — sending invites out three to four weeks ahead of time is generally a good rule of thumb depending on the event. Save more time and pool your resources with neighbors and friends by coordinating a carpool for games, school drop-offs, rehearsals or other activities. Do your best to start the year healthy and avoid the flu. Book doctor appointments for the year — and don’t forget to incorporate healthy snack options for your kiddos. Outline New Year’s resolutions that you can actually accomplish. You can teach your kids — and remind yourself — about the importance of setting measurable and achievable goals. Plan ahead of the busy season at work. For instance, teachers can start organizing for the remainder of the school year now. You will thank yourself in April as end-of-year events begin to pile up! Running a small business or coordinating a group of clients? Collect payments and coordinate product sales or event registration at the same time with a sign up. Remember that healthy employees perform better. Start a corporate wellness program at your company and see dividends as the year progresses. Genius Tip: Organize corporate wellness perks in the new year with a sign up. Break up work routine by asking some get to know you questions in company meetings. Start building community in new groups that you join or lead this year. Children, adults and everyone in between can get to know each other better with this list of conversation starters. Use a few fun icebreakers with your middle or high school students to spark friendships. When new groups form in church youth ministries or school clubs, it can be awkward for students to strike up a meaningful conversation. Bring members together with food! Genius Tip: Everything will run smoothly when you coordinate a potluck with a sign up. Any group can benefit from a creative potluck party theme. Bring people together by resolving to help others. Use these 50 community service ideas as a good starting point. When you plan things well, you have more time for the things that matter. The SignUpGenius team wishes you a happy, healthy and organized new year!